The 7th Operations Group is the operational flying component of the United States Air Force 7th Bomb Wing, stationed at Dyess Air Force Base, Texas. The 7th Operations Group currently flies the B-1 Lancer. Dyess Air Force Base, Texas. The 7th Operations Group is a direct successor organization of the 7th Bombardment Group, one of the 15 original combat air groups formed by the United States Army before World War II. Activated in 1921, it inherited the lineage of the 1st Army Observation Group, which was established and organized, on 6 September 1918. The 7th Bombardment Group was deploying to the Philippines when the Imperial Japanese Navy Air Service attacked Pearl Harbor on 7 December 1941. Six of the group's B-17 Flying Fortress aircraft which had left Hamilton Field, California on 6 December 1941 reached Hawaii during the enemy attack, but were able to land safely. The unit later served in India during World War II. In the postwar era, the 7d Bombardment Group was one of the first USAAF units assigned to the Strategic Air Command on 1 October 1946, prior to the establishment of the United States Air Force. Equipped with low-hour B-29 Superfortress surplus World War II aircraft, the group was inactivated in 1952 when the parent wing adopted the Tri-Deputate organization and assigned all of the groups squadrons directly to the wing. Reactivated as the 7th Operations Group in 1991 when the 7th Bomb Wing adopted the USAF Objective organization plan. Both the 9th and 28th Bomb Squadrons fought in combat on the Western Front of World War I, and histories predate that of the Operations Group. The group's emblem, approved in 1933, features three crosses symbolizing its squadrons' battle honors. The diagonal stripe was taken from the coat of arms of Province of Lorraine which France took back from Germany in World War I. In the summer of 1918 and the organization of the United States First Army in France, the First Army Observation Group was organized at Gondreville-sur-Moselle Aerodrome on 6 September. The group initially consisted of the 91st and 24th Aero Squadrons, which flew over the front into enemy territory. Aircraft from the group took numerous air photos and compiled maps of enemy troop concentrations, road convoys, railway traffic, artillery and other targets during the Battle of Saint-Mihiel in mid-September. On 22 September, the group changed stations, moving to Vavincourt Aerodrome. At Vavincourt, the 9th Aero Squadron (Night Observation) was assigned to the unit. With the addition of the 9th, both day and night patrols were made over enemy territory, with intelligence being returned to First Army headquarters. The duties of the group consisted of long-distance patrols far into the enemy rear areas, both visual and photographic. Special attention was paid to enemy movements on roads, canals and railways. Railway stations and marshalling yards were noted, along with supply depots, airfields and munition storage areas. Once located, they were kept under routine observation. Also, the locations of enemy heavy artillery batteries were monitored and their movements recorded. The First Army OG flew no less than 521 successful missions, with a total of 1,271 sorties being made. Daily battles with enemy aircraft were engaged, with the group shooting down 50 aircraft in 111 aerial combats. With the Armistice with Germany being reached on 11 November 1918, the group ceased flying into enemy territory, but maintained an alert for several weeks afterward. After World War I, the Army Air Service was re-organized on a permanent basis. The 1st Army Observation Group was organized at Park Field, Memphis, Tennessee on 1 October 1919. It was transferred to Langley Field, Virginia and was assigned the 1st, 12th and 88th Aero Squadrons, equipped with surplus de Havilland DH-4s. On 14 March 1921, with the formation of the United States Army Air Service, it was re-designated as the 7th Observation Group. It was inactivated due to funding issues on 30 August 1921. 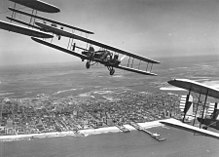 Curtiss B-2 Condor formation flight over Atlantic City, N.J. S/N 28-399 is in the foreground (tail section only). Aircraft were assigned to 11th Bombardment Squadron, 7th Bombardment Group at Rockwell Field, California. This flight of 4 aircraft completed cross-country flight to Atlantic City, NJ. The group was re-formed at Rockwell Field, San Diego, California and activated on 1 June 1928. The re-formed Group was assigned the 9th, 11th, 22d and 31st Bombardment Squadrons. The 9th, 11th and 31st squadrons lent their World War I lineage to the group’s emblem as indicated by the three Maltese Crosses on the shield. While the group was assigned at Rockwell Field, the fledgling Air Force was testing new theories and ideas. In early 1931, the 7th began training aircrews in radio-controlled interception. A bomber, acting as a target, reported by radio to a ground station, giving location, altitude and course. Armed with this information, ground controllers guided pursuit aircraft to the objective. The 7th was transferred to March Field, Riverside California, on 29 October 1931 with its 11th Squadron joining the 9th and 31st Bombardment Squadrons which had been activated on 1 April 1931, but had not been manned. The Curtiss B-2 Condor was flown by the 11th; the 9th flew the Keystone B-4; while the 31st flew 0-35s, B-1s, and B-7s. A sprinkling of other aircraft types from the era was also found among the squadrons. For 102 days in 1934 the Army Air Corps flew domestic air mail routes, assigned to the job by an executive order from the White House. This followed a year long investigation that alleged fraud and collusion among the dozen or so airlines who hauled the mail for a subsidy of fifty four cents per mile own. Following the closure of Rockwell Field in San Diego, the 7th had to make room at March for the 19th Bomb Group. Overcrowding at March and the opening of the new Hamilton Field near San Francisco led the group to be transferred on 22 May 1937 and equipped with B-18 Bolos. Equipped with the new B-17C in 1939, runway issues at Hamilton Field forced a transfer to Fort Douglas/Salt Lake City Municipal Airport, Utah on 1 September 1940 which could better handle the large, heavy bombers. In Utah, the group was re-equipped with the B-17E – the first Fortress to introduce a completely new rear fuselage with a manually operated turret housing two 0.50-inch machine guns fitted in the extreme tail. With the crisis in the Pacific in late 1941, ground elements departed from Fort Douglas 13 November 1941 and sailed from the port of San Francisco on 21 November on an army transport en route to the Philippines. Aircraft and crews began departing Muroc Field, CA, on 6 December en route to Hawaii. Elements of the group flew their B-17s into Hickam Field at the height of the Japanese attack on Pearl Harbor. A captured B-17E (AAF Ser. No. 41-2471) of the 7th Bomb Group in Japanese service, 1942. The aircraft crash landed on 8 February 1942 at Yogyakarta, Java and was abandoned. It was repaired by the Japanese and used for training to develop fighter tactics against the B-17. The eventual fate of this aircraft is unknown. The group was in the process of moving to the Philippines when the Japanese attacked Pearl Harbor on 7 December 1941. Six of the Group's B-17 aircraft left Utah on 5 December for deployment to the Far East. Six of them arrived in Hawaii but landed safely at alternate airfields, avoiding destruction by the attacking Japanese aircraft. The rest of them were ordered to defend California against the Japanese threat, since in the hysteria of the moment the Japanese fleet was expected to show up off the Pacific Coast at any time. The ground echelon, on board a ship in the Pacific Ocean, was diverted to Brisbane, Australia. The air echelon moved its B-17Es via North Africa and India to Java, where from 14 January to 1 March 1942, it operated against the Japanese advancing through the Philippines and Netherlands East Indies. Received the Distinguished Unit Citation (DUC) for its action against enemy aircraft, ground installations, warships and transports. 7th BG B-24s attacking the Moulmein-Ye rail line, Burma, 1945. The group's B-17Es were distributed to other bomb squadrons in Australia, and the air echelon was reunited with the ground echelon in India in March 1942, being equipped with longer-range B-24 Liberators. From bases in India, the group resumed combat under Tenth Air Force against targets in Burma. It received B-25 Mitchells and LB-30s in early 1942 but by the end of the year had converted entirely to B-24s. From then through September 1945, bombed airfields, fuel and supply dumps, locomotive works, railways, bridges, docks, warehouses, shipping, and troop concentrations in Burma and struck oil refineries in Thailand, power plants in China and enemy shipping in the Andaman Sea. Ceased bombing operations in late May 1945 and was attached to the Air Transport Command to haul gasoline over "The Hump" from India to China. Received second DUC for damaging enemy's line of supply in Southeast Asia with an attack against rail lines and bridges in Thailand on 19 March 1945. Returned to US in December 1945 and inactivated the following month. Activated on 1 October 1946 as a B-29 bombardment group and trained with B-29s in global bombardment operations, November 1947 – December 1948. Personnel and aircraft of the new group, consisting of the Boeing B-29 Superfortress, were transferred to Fort Worth AAF from the 92nd Bombardment Group at Spokane AAFld, Washington. Arrival of the first B-36A at Carswell "City of Fort Worth" (AF Serial No. 44-92015), in June 1948 along with a 7th Bomb Wing B-29. With its B-29s, the 7th prepared its people for any combat eventuality that might arise, flying simulated bombing missions over various cities. On 5 July 1947, a flight of eight B-29s of the 492nd Bomb Squadron deployed from Fort Worth AAF to Yokota AB, Japan. Shortly after this the detachment received orders to redeploy to Fort Worth AAF via Washington, D.C. The aircraft left Yokota AB on 2 August, flew over the Aleutian Islands, then into Anchorage, Alaska. From Anchorage the flight flew over Edmonton, Alberta, Canada, turned south and flew over Minnesota and Wisconsin. The bombers flew a low-level flight between The Pentagon and Washington Monument in the Capitol on 3 August. Completing this aerial demonstration, they headed for Fort Worth, landing 31 hours after launch from Japan and covering 7,086 miles. On 12 September, the group deployed 30 B-29s to Giebelstadt Army Airfield, near Würzburg, West Germany. This flight was the largest bomber formation flown from Fort Worth AAF overseas to date, landing in Germany on 13 September. During their ten-day stay, the group bombers participated in training operations over Europe, as well as a show-of-force display by the United States in the early part of the Cold War with the Soviet Union. The flight redeployed from Germany on 23 September. In June 1948 the first Consolidated B-36A Peacekeeper was delivered. The first B-36 was designated the "City of Fort Worth" (AF Serial No. 44-92015), and was assigned to the 492d Bomb Squadron. With the arrival of the B-36s, the wing was redesignated as the 7th Bombardment Wing, Heavy on 1 August. B-36s continued to arrive throughout 1948, with the last B-29 being transferred on 6 December to the 97th Bomb Group at Biggs AFB. For 10 years, the "Peacemaker" cast a large shadow on the Iron Curtain and served as our nations major deterrent weapons system. As part of the 7th Bomb Wing, the 11th Bomb Group was activated on 1 December with the 26th, 42nd, and 98th Bomb Squadrons, Heavy, were activated and assigned. The 11th Bomb Group was equipped with B-36As for training purposes. A five ship B-36 formation was flown on 15 January 1949, in an air review over Washington, D.C., commemorating the inauguration of the President of the United States, Harry S. Truman. In February 1949, a B-50 Superfortress (developed from the famed B-29) and named Lucky Lady II took off from Carswell for the first nonstop flight around the world. She returned to Carswell after mid-air refueling, flying 23,108 miles, and remaining aloft for ninety-four hours and one minute. In January 1951, the 7th took part in a special training mission to the United Kingdom. The purpose of the mission was to evaluate the B-36D under simulated war plan conditions. Also, further evaluate the equivalent airspeed and compression tactics for heavy bombardment aircraft. The aircraft, staging through Limestone AFB, Maine, would land at RAF Lakenheath, United Kingdom, following a night radar bombing attack on Helgoland, West Germany. From there the bombers would conduct a simulated bomb run on the Heston Bomb Plot, London, finally landing at RAF Lakenheath. On 16 February 1951 became a paper organization. With all assigned flying squadrons reassigned directly to the 7 Bombardment Wing as part of the Tri-Deputate organization plan adopted by the wing. The group inactivated on 16 June 1952. A B-1B from the 7th Operations Group releases a Joint Air-to-Surface Standoff Missile over the White Sands Missile Range, N.M.
 As part of a major Air Force-wide reorganization due to the implementation of the Objective Wing organization, the Group was redesignated 7 Operations Group and again became the combat element of the 7 Wing. It controlled two B-52 squadrons and one KC-135 air refueling squadron. When flying operations ended at Carswell AFB, TX in December 1992, the group inactivated the following month. Upon activation of the 7 Wing at Dyess AFB, TX on 1 October 1993, the group again activated as the combat element of the wing. Equipped with B-1B and C-130 aircraft, the group's mission included bombardment and tactical airlift. It lost its airlift responsibilities in April 1997. At that time it also gained a conventional bombing mission. In November 1998, deployed several aircraft to Oman in support of Operation Desert Fox, where the B-1 flew its first combat missions on 17 and 18 December 1998. Since 1999, trained bomber aircrews for global conventional bombing. 493d Bombardment Squadron: 25 October 1942 – 6 January 1946. ^ a b c Series "C", Volume 8, History of the First Army Observation Group. Gorrell's History of the American Expeditionary Forces Air Service, 1917–1919, National Archives, Washington, D.C.
^ a b c d e f g Clay, Steven E. (2011), US Army Order of Battle 1919-1941. 2 The Services: Air Service, Engineers, and Special Troops 1919-1941. Archived 27 September 2013 at the Wayback Machine Fort Leavenworth, KS: Combat Studies Institute Press. ISBN 9780984190140. ^ "History of the 7th Bombardment Group/Wing". 7th Bomb Wing B-36 Association. Archived from the original on 4 January 2015. Retrieved 6 October 2016. The American Army in the World War, A Divisional Record Of The American Expeditionary Forces in Europe, G Waldo Browne, Rosencrans W. Pillsbury, 1921, Overseas Book Co, Manchester, New Hampshire.